On the left, a work-in-progress splash page illustrated by Pat Spaziante. The middle, a text-less version of issue #1's cover art. These two pieces coincide with a lengthy but highly insightful interview with Flynn, who goes on to discuss Archie's take on the franchise. Definitely worth a read, check it out here. "Here is the first draft for the alternative variant for Megaman coming out this April! Poor Dr. Light had to be cut for upc reasons and now looks more like THIS. It’s been a long year getting things out of the way and in order to do Megaman here in the coming months and I’m very excited for it. I feel a lot more comfortable with the character now, and good advice from peers has me more excited and ready to have some fun drawing. I know my style isn’t as manga-ized as a lot of die hard MM fans are used to, but I’m having a lot of fun working on some pages right now and I’m confident a lot of you will like it. Ian is going to do a lot of fun stuff with the book, and has a great interview on Newsarama right now with some fantastic Spaz preview art so check that out. " Kind of unfortunate we had to lose Light; I rather like the way he complements the whole image. So, at this point, which of the two artists do you prefer? "Spaz" or Thomas? I'm more of a Spaz fan myself, but I'd definitely like to see more of Thomas' stuff. Thanks for the tip, Generic Overlord! 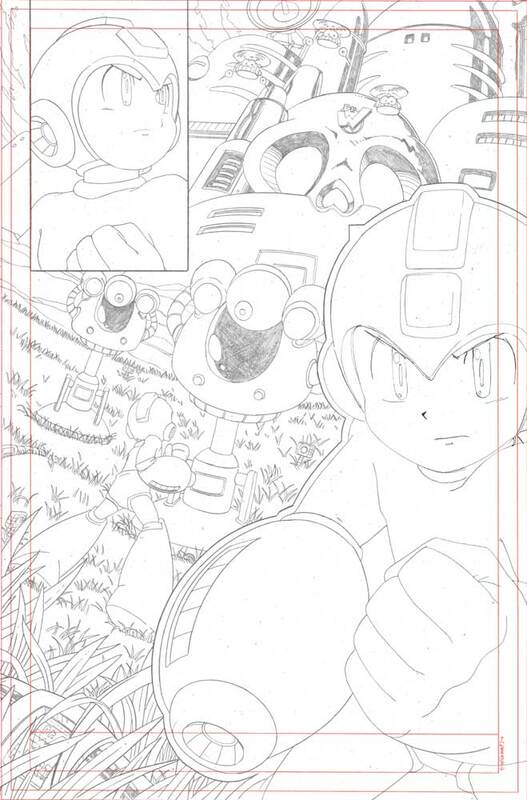 Pat Spaziante was born to draw Megaman!! He was so boss on the last MM comic attempt and needs to be the head artist for this series, period. So looking forward to see what he does with the series. Spaz, no question. Chad's a great artist, but, as said, his style just doesn't work for Mega Man. Being a fan of Spaz's work since Sonic #39 and already knowing what he can do to the Classic and X series thanks to Dreamwave it's... sort of no contest. Personally, I think both art styles look equally as good as the other. Spaz. The guy had his destiny made on drawing Megaman. Spaz FTW! Chad's art style doesn't fit with Megaman at all. Is that Mega Man 2's castle in Mega Man 1? Oops! I mean I know 1's isn't exactly well known, but it still exists. I just can not wait for this, the awesome art, the faithful stories. The comics are gonna be awesome! Dr.Light in Chad's Cover makes it seem more sensible, actually. Spaz's art style is amazing. It's a pretty faithful recreation of that Legends' artist's work for the Classic series, and his art is very nice too. I'm glad he's on the project, Chad has nice art (I really like how Light looks in that page-- I'm almost a little disappointed he got cut) but I think it's cool seeing the comic in a style that looks so official. Spaz. It's not to say Chad didn't draw a good Rock--...Mega Man, but Mega (and Dr. Light in the old version) looks too mean-looking. He's not supposed to be a blue death machine. He's supposed to fight for justice and for the good of mankind. That, and I don't like the fact that there doesn't seem to be any real reason for Mega Man to be in a build capsule if he's already been upgraded and, in fact, looks just fine. Maybe it's just the lore geek in me preventing me from enjoying-- No. No, that alternate cover is just a bad cover all around. However. He might be better suited to doing work for a Mega Man X series, should it roll around. ...So, does anyone prefer Spaz's artwork for technical reasons, and not just "it looks exactly like the games (or at least Mr. Ishikawa's style), therefore it's better"? I like both, myself. I'm also curious as to how many issues the MM1 adaptation will take (hopefully not just one, because then it might feel cramped and rushed). 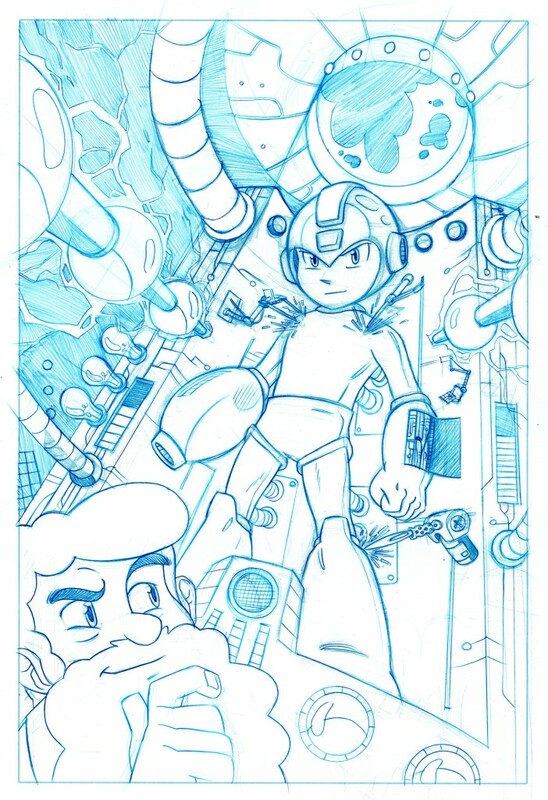 Spaz's art is amazing -- seems like he was always meant to draw Mega Man. Chad... well, I'm sure he's a great artist otherwise, but his style sure doesn't fit Mega Man. It's pretty awful. Everything is right about the center cover image. It's perfect. The right-most picture by Spaz is also amazing. Like an anonymous said, Spaz seems to bhave been BORN to draw MegaMan. His art has single-handedly maintained my faith that this comic can be great, and is the source of my excitement for it. The one of the left is ok. Not the best, but still alright. That Dr. Light, while very faithfully drawn (more so than MegaMan's face), had an oddly devious look on his face, so.. it's ok with me that he's gone. I'm not sure I agree with RADIX's implication that the fact that Spaz's style is so similar to an official one isn't a good reason to prefer the art style. We're not all art critics, after all, so not many of us can dwell on the finer points of the art. 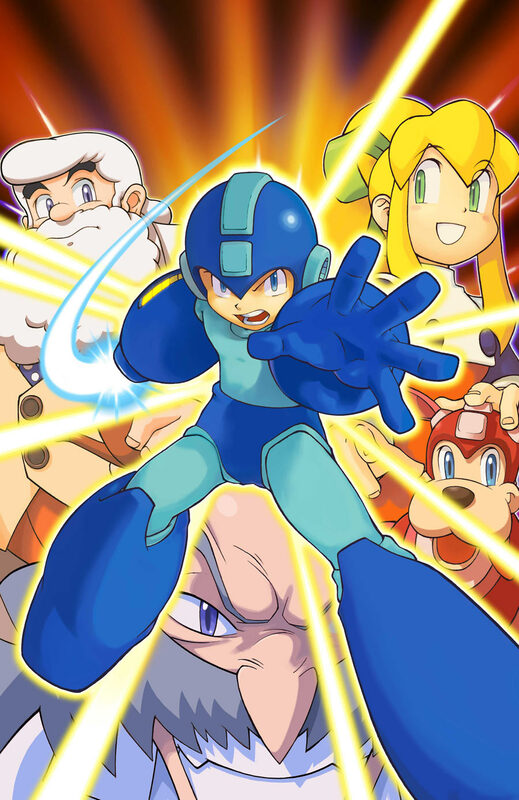 And this combination of "his style is perfect for Megaman" combined with his illustrations most closely resembling Mr. Ishikawa's MM art just leads to (hopefully unintentional) implications that artists like Ariga aren't the "right" ones for MM, due to not being a perfect match on the games. At least, I think. @RADIX: I understand what you mean, but I think you're over-interpreting things. I have never heard any one complain about Ariga's style-- and it would be silly to do so. It's fantastic. Just because people prefer Spaz's because it looks more "official" doesn't mean people hate Ariga's or Chad's because it doesn't. I bet a lot of people here would even prefer Ariga's even over Spaz's. Radix you realize there does not need to be a technical reason for prefering one art-style over another. Even if people were basing this off of a purist train of thought; that is not neccesarily a bad thing (nor is it good). My reasoning for disliking Chad's stuff? His proportions are awkward. His facial expressions not in character. Poses are STIFF. And to end it all he abuses lighting in a way displeasing to my eyes. Overall: Decent for Fan-art, less-than-decent for official work. I also doubt that he is truely a fan of megaman because he doesn't even appear to have a basic grasping of the Megaman(classic) backstory. I like Spaz better. It's close to Hideki Ishikawa's style which I love. Chad's sort of reminds me of "Mega Man" from Mega Man Universe.